With easter coming up, thought it would be good to track the lowest prices of the 2019 batch of easter eggs focused on a selection of products that were relevant to me. Most of this I pulled together after the fact from Price Hipster so I may have missed some historic prices. It's not mainstream but at my local Lindt outlet (university hill) on the weekend they were doing 50% off all Easter chocolate. Unsure if they are carrying this promo through all Easter but worth a look. 100gm gold bunnies were $3.15 each for example. Might go get some this week. Although from memory last year, on the Saturday morning after good Friday, easter eggs were selling very cheap, so if you can wait for the day before, you might be able to save a bunch of cash! I only wish Haighs went on sale. Sigh. Title error? Title:"Large Cadbury Bunny $2.50" Description:"Large 250g Woolworths(woolworths.com.au) $4"
Having visited the Charleville Bilby Experience last year, I was going to buy Easter Bilbies this year for the kids. The problem is they only seem to be sold at Target, Myer and David Jones, and they are $6.50 for 150g ($4.33 per 100g) and only 30 CENTS goes to the Save the Bilby Fund (https://www.target.com.au/p/chocolate-bilby-15-g/58742709). You could purchase 4 of the 250g bunnies for $16 and donate $5 to the bilbies and the $21 spent gets you 1kg of Cadbury chocolate, which is double the chocolate than if you bought the chocolate bilbies, plus the bilbies get $5 vs less than a buck. What is the chocolate like in comparison to standard Cadbury? All Cadbury chocolate has gone down hill in recent years. It has got to the point that I barely taste chocolate. Far too sweet. I would welcome higher pricing if the quality was still the same. And the $5 donation is tax deductible. isn't the trick to wait until after easter anyway when they need to clear unsold? All my locals sell out, the Saturday morning stuff is generally only the really cheap nasty chocolate. Stock levels seem to be lower each year. I never really get the hang of this trick…will they clear stock after easter sunday or prior to that? Everytime I attempt to get clearance chocolate there's only the horrible stuff left. I would've thought for a place like OzBargain it wasn't a trick, but a condition of entry that you do this; repeat for Christmas decorations and so on. Does Aldi sell Cadbury at all? Do they have a range of easter chocolate? Is it good? Lindt Easter eggs 390 gram pack is $10 at coles. The catalgue says on 50% sale for 2 weeks but no rain checks! Any specials on Easter Walruses? Damn, I always peak too early! 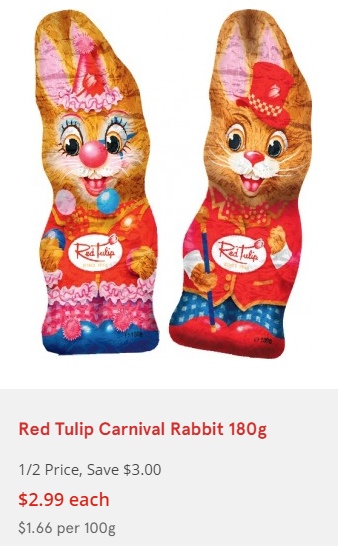 I noticed some half price Red Tulip bunnies at IGA this morning, but don't know how they compare to the above. thanks for the info. I ate the first lot before the bunny distributed. Hope there are some half price in the shops this afternoon. Anyone seen any specials tonight? Local Woolies closes in half an hour.